As I've mentioned in my previous post Why using yeast for research? one of the applications of yeast for research is in the field of discovering new antifungal drugs. In order to do this the studies are focused on the yeast cell wall. 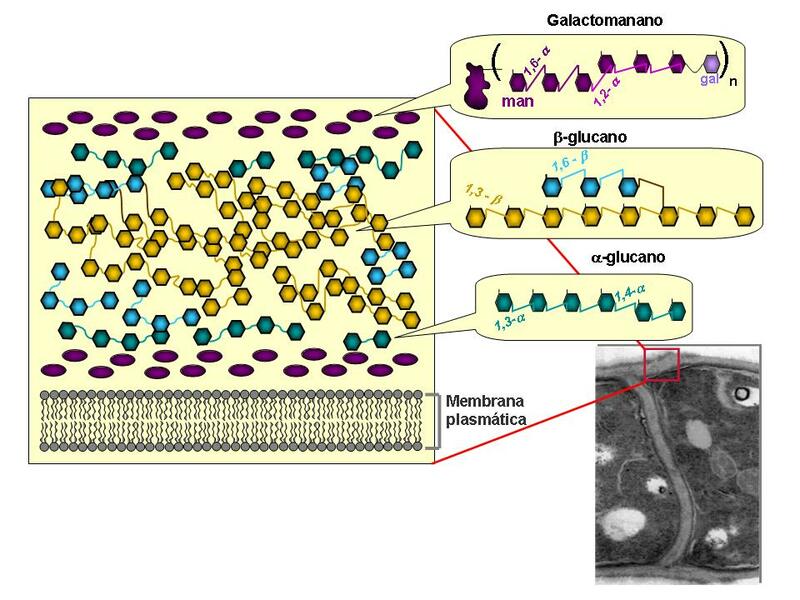 This cell wall is present in yeast and fungi but not in human cells. So, to continue with my posts about basic research with yeast, today I'm going to write about a study done by some scientists I used to work with during my PhD in Salamanca. This study is about a protein that transfers sugar chains, made by the cell, to other chains fostering the intertwining between them to form the cell wall. The formation of these "plaits" after the action of this protein helps the cell to be alive and not explode!!!! The protein I'm talking about is gas1 and is a glucanosyl-transferase (there you have, hehehe). This means that it transfers groups of sugars ("glucanosyls"). Yes, sugars. Because the yeast cell wall is composed of different kind of sugars. 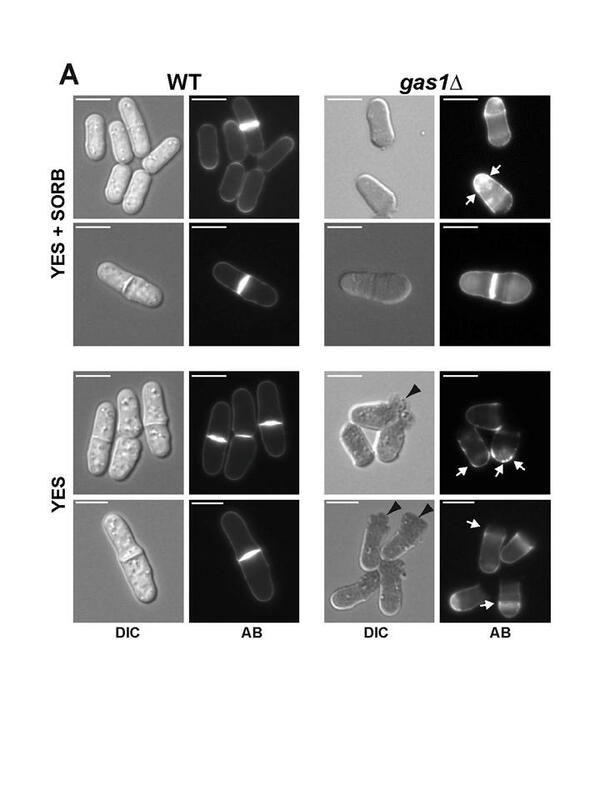 These sugars bind to each other forming long chains that can be linear or branched (as it is drawn in the first image) and composed of different sugar molecules: a-glucan, b-glucan or galactomanan in S.pombe (the yeast this study is done with). These chains get formed, branched and intertwined to build a compact cell wall to protect the yeast from the environment. A kind of blanket that surrounds the cell and keeps it safe from the external inclemency. But what happens when this blanket is not enough close-woven because the spins haven't branched properly and they are not intertwined in the right way? It's very easy. The blanket has holes and cannot protect the cell as it should and the cell is now defenceless. 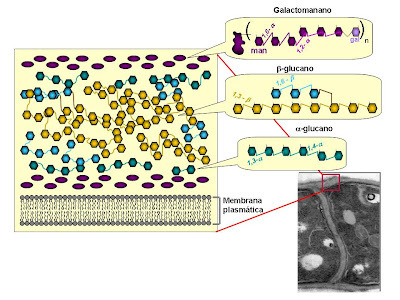 The cell wall is this blanket. When the gene of the gas1 protein is deleted from the yeast, these sugar chains cannot branch properly nor intertwine as they should. What happens to the cell then? It explodes!!!! yes, yes, it explodes because it cannot keep the balance between its content and the environment. You can see the effect that deleting gas1 has in the yeast cells in the picture on your right (bottom-right square, black arrowheads). 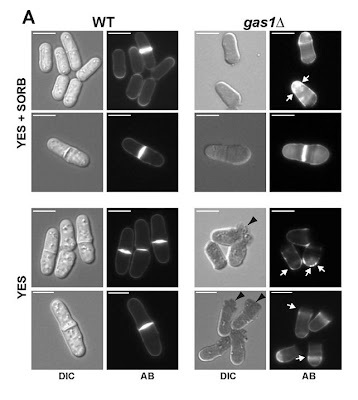 The conclusion of this work is that the gas1 protein is essential for the yeast to survive in a regular medium. Without it the cell dies unless is placed in a special medium in which it doesn't die but is very sick. As many of you have thought reading this post, gas1 is a very interesting protein to develop a new antifungal drug. So, producing a drug that prevents gas1 to work properly, could make the fungi cells in the infections to die exploding? I don't know, but I do know that this study is a very good first step to find the answer to this question. P.S: I would like to thank my PhD supervisors Drs. Francisco del Rey and Carlos R. Vázquez de Aldana the opportunity they gave me to work in their lab in the Institute of Biochemical Microbiology (now Institute of Fundamental Biology and Genomic) in Salamanca and all my colleagues I worked with during that time.